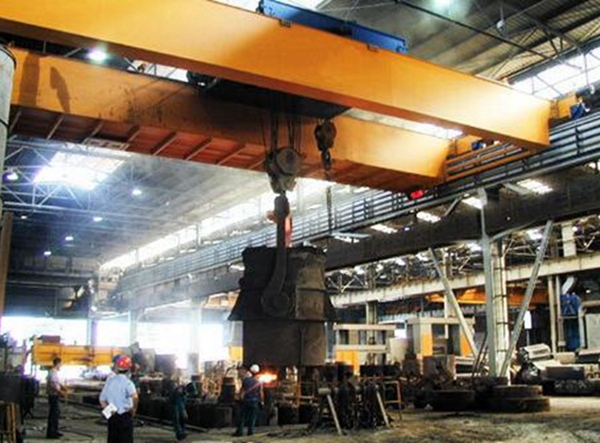 Industrial Overhead Crane Supplier Has Small Crane Large Crane Best Price Top Quality! 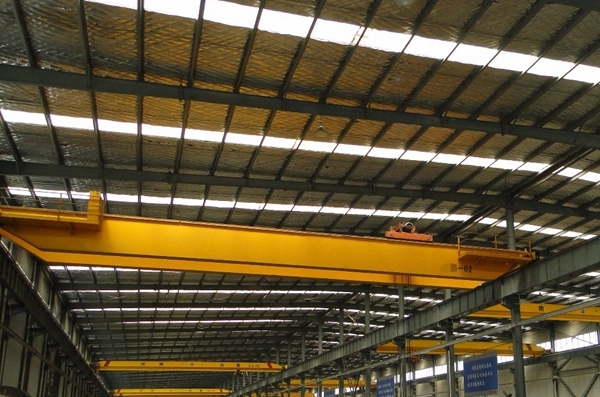 Industrial overhead crane has many advantages, for example, it can be used both indoor and outdoor, it can work on heavy duty, it adapts to hazardous working conditions. And it has good insurance of crane safety to protect both the crane system and crane operator. Ellsen Group, one of famous crane suppliers, provide multi-function construction cranes with excellent quality and reasonable price. 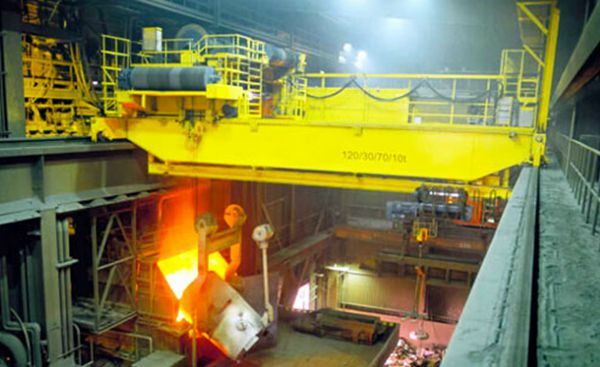 Ellsen has many types of industrial bridge cranes, such as bridge foundry crane with hook for factory, low price explosion proof bridge crane for factory, cheap electromagnetic overhead crane, warehouse European double girder bridge crane, workshop casting overhead crane etc. Customers can choose suitable one according to practical needs. 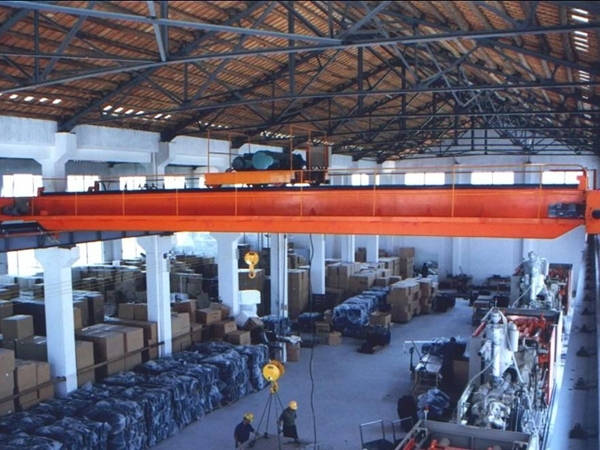 The industrial travelling crane is widely used in loading, unloading and transferring goods and materials in port, power station, mechanical manufacturing factory, metallurgy workshop, warehouse, workstation and the industries of oil, petrochemicals, railways, civil aviation, paper making, building materials, electronics etc. when using in places with flammable and explosive mixture, explosion proof crane is better. There are two ways to operate the crane system, ground control and cabin control. Cabin control has two styles, open type and close type. Ellsen provides installations for the products we manufacture as well as other manufacturers’ material handling products. Ellsen has the expertise to install lifting device around customers’ schedule and in complex situation like hazardous environments. With a professional team of services technicians, it will expertly lift and rig customers’ new crane in place. Ellsen has the critical mass to mobilize a team to safely install the crane on schedule. An overhead gantry crane will save a company an enormous amount of time and energy which will be clearly evident in the bottom line. A modern overhead gantry crane can become a vital resource to help save valuable manpower and time in an industrial warehouse or manufacturing type facility. -An overhead gantry crane is a valuable piece of machinery that can be used to great effect in a large range of different applications. 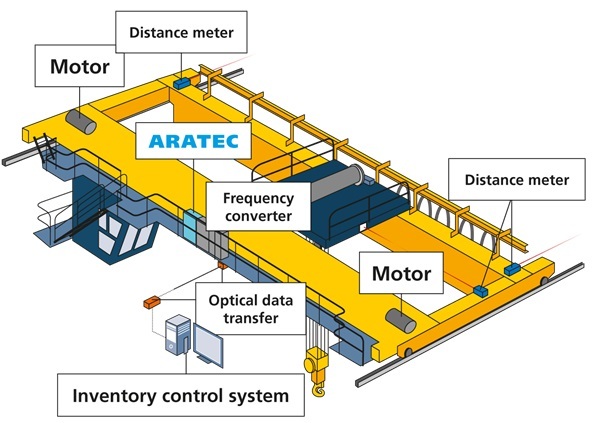 It allows the movement of heavy loads such as shipping containers, warehouse boxes or any other heavy objects from one location to another in a cost efficient way. 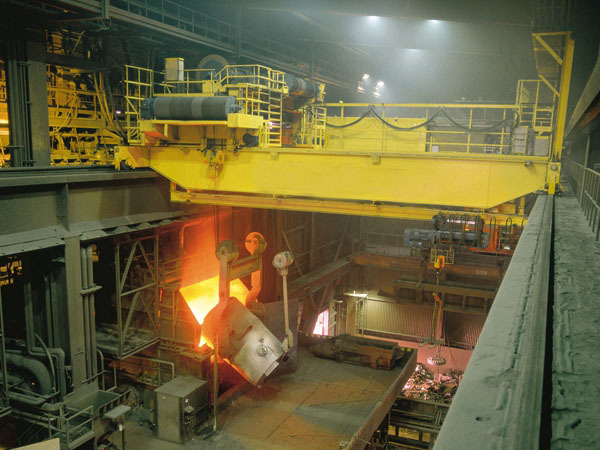 A gantry crane can help workers to lift and move heavy, back-breaking loads from one end of a facility to the other, saving valuable labor resources. 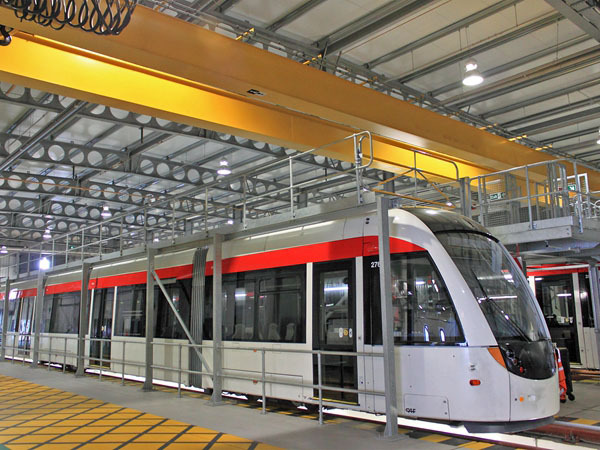 -An overhead gantry crane is a great alternative to a large permanent system. They offer up to 15t lifting capacity and they are completely mobile and versatile. They can be used in- or outdoors and the adjustable spans, heights and treads allow heavy loads to be moved easily around obstacles or even through doorways. -The use of a gantry crane frees valuable manpower hours to be used in other applications and also reduces the risk of injury to workers. -Some overhead gantry cranes can be operated by a single person, reducing the need for a large workforce. -Gantry cranes are usually lightweight and portable and can be positioned in any location. -Overhead gantry cranes are extremely versatile and can be used in many different ways, for example, they can be calibrated to operate on uneven surfaces or on inclines or declines. -The workstation can be assembled in just a few minutes in a new location and can be quickly and easily moved from one place to another in a warehouse with minimal manpower. -The unparalleled versatility of a portable gantry crane means that it can be moved to another location entirely and reassembled quite easily. -An indoor gantry crane can cope with any load from 1t to 30t, depending on overall specifications of the particular crane. 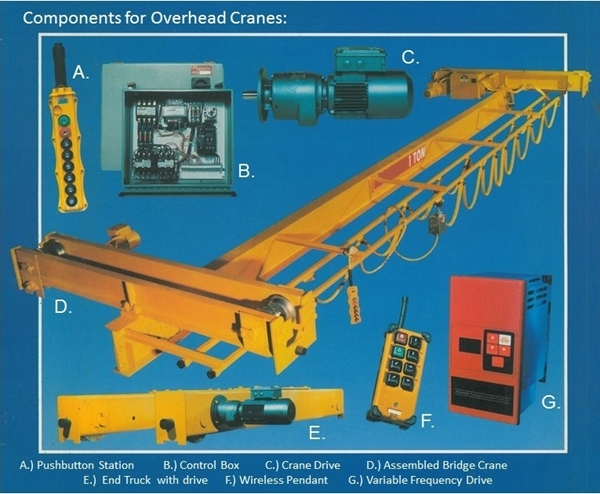 If you’re in the market for an overhead crane, you’re going to want to select your product wisely. After all, this is a major purchase. When you spend that much money, you deserve to get exactly what it is you’re paying for. Make sure you keep all of these tips in mind as you search for the best possible product. No matter what kind of crane you’re after, you should be able to find yourself an excellent deal. Before you start your search, determine exactly what your needs are. What kind of functions will you need your crane to perform? How much are you comfortable spending on an overhead crane? If you don’t figure out all of these things beforehand, you may wind up shelling out for features you won’t actually use. From budget to functionality, the more you know about what you want, the easier it will be for you to shop smart. Unless you’re in a tight position, there’s no reason to run a purchase like this. Take your time and shop around. Keep an eye out for discounts and special offers. Don’t spring on a purchase unless you’re sure you’re getting a good deal. Although coupons and clearances are harder to come buy when you’re shopping for industrial equipment, you can find discounts if you take the time to look for them. Season changes are a particularly good time to make a purchase, as many companies get new stock at this time. Keep your eye on prices and wait for them to drop. It’s likely that you know a lot of people who are familiar with cranes. Make sure you take full advantage of this expertise. Talk to the people you know who have purchased overhead cranes, and find out what their experiences were like. When you know what brands and products to look for, shopping is a lot easier. The more information you have, the easier it will be for you to find what it is you’re after. If your budget is tight and you don’t have specific needs, you may want to consider buying a used product. While industrial equipment does hold its value, a used product will still be considerably cheaper than a new one will. There are a number of ways to buy used products. You could buy them from a company that rents out industrial equipment, or from a company that’s replacing its old equipment. No matter where you choose to make your purchase from, you should be able to get an amazing deal. Although it can be a challenge to find a cost-effective overhead crane, it definitely isn’t impossible. If you keep these tips in mind, you should be able to buy a piece of equipment that’s well within your budget. Explore all of your options, and shop around until you find a piece of equipment that’s a great fit for you. How to ensure security of industrail overhead crane? An overhead crane can be one of the most beneficial aspects of any business that is responsible for transporting cargo from one location to another. It can also be responsible for many injuries if it is not properly maintained. Proper security and safety must be of utmost importance for not only the operator, but making sure that people in and around the crane are always safe. 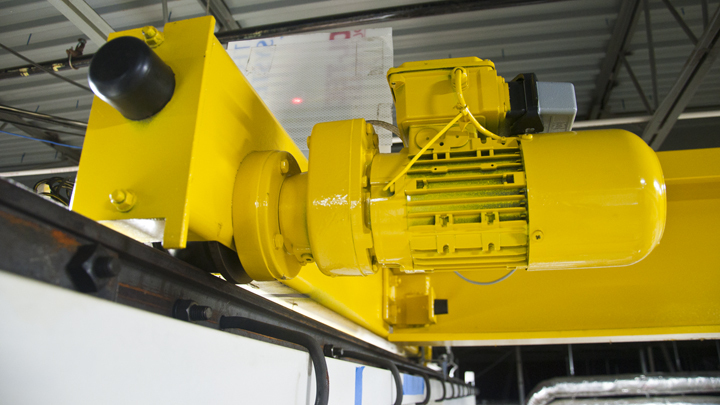 Inspections must be done on a regular basis to make sure that each portion of the overhead crane is maintained, making sure that pieces will not fall apart, leading to injuries. Here are a few tips to consider if you are responsible for a gantry crane that you are using at a worksite. 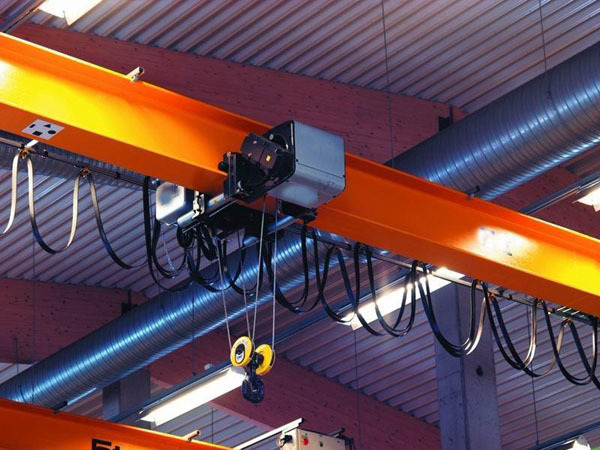 What is an overhead crane used for? Whether you are referring to this as a bridge crane, gantry crane or an overhead crane, they are all constructed in a similar manner. 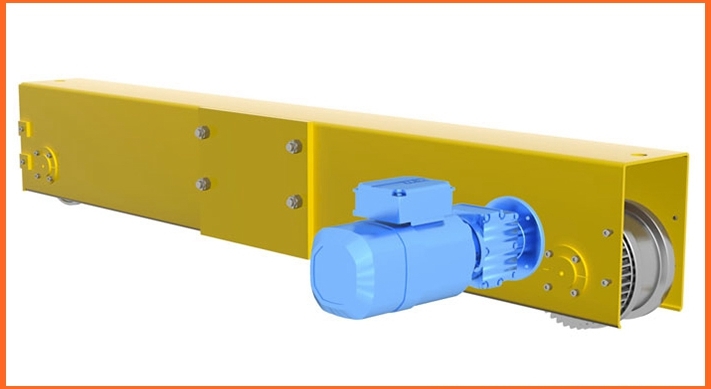 Found in many different industrial environments, it consists of supporting beams below, and overhead beams that are used in two different ways. There will be parallel runways in which the ends of the overhead beam with the hoist will travel, allowing the merchandise to be lifted and moved to different locations. As long as the entire mechanism is secure, and that includes the hoist and trolley, there should be no problem with maintaining high security and safety levels. Even if a gantry crane is newly constructed, safety checks must be done every day. The base plates must be examined to make sure they are secure in the ground. This is what will provide the support for the support posts for the entire mechanism. The truss style beams that will serve as runway beams on either side must also be secure as they are supporting the trolley frame that goes back and forth. The mounting of the hoist, as well as the hook and block at the bottom which is what will attached to the merchandise to lift and lower it, must also be examined regularly. There is also the possibility that the wheels that are in the runway rail can become dislodged, so inspections need to take these into consideration. As long as the end truck and and truck bumper are fully functional, it should have no problem rolling back and forth and also coming to a stop. Most of the accidents associated with an overhead crane have to do with faulty welding which can cause the entire apparatus to come down. This is rare in comparison to the trolley and hoist not being properly mounted and this should be checked on a regular basis. If this falls, or becomes dislodged, especially if it is lifting a heavy load, can lead to injuries down below and the destruction of merchandise because of a faulty installation. It is important to utilize the help of those that are well aware of welding techniques, and also the construction of the entire apparatus itself. They can make regular safety checks from the remote control room, and also physical inspections, just to make sure everything is operating properly. Bridge crane has many types. 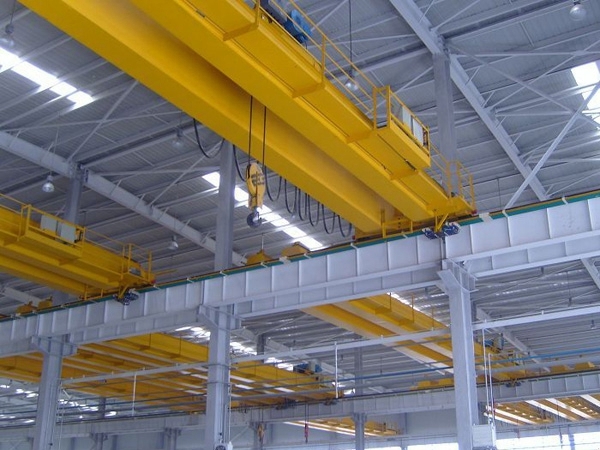 According to crane girder, it can be divided into single girder overhead crane and double girder overhead crane. Before comparing the differences between bridge crane and gantry crane, learn the traveling principle of bridge crane. Crane traveling mechanism adopts two driving wheels and two driven wheels. If the lifting weight is heavy, just increase the wheels to decrease the wheel pressure. When the wheels exceeds four, hinged balance frame device is necessary. 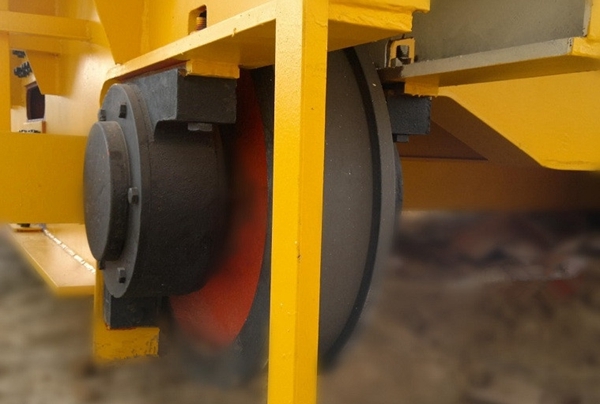 This device can make the load distribute on each wheel evenly. Main girder and end girder are connected by strong bolts. There are wheels on the sides of end girder to support the bridge frame traveling. The rail welded on the main girder is used for trolley traveling. Main girder has typical types as box structure, four truss structure and hallow truss structure. 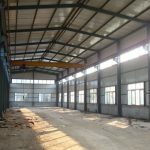 Crane metal structure is composed of main girder and end girder. It includes single girder frame and double girder frame. 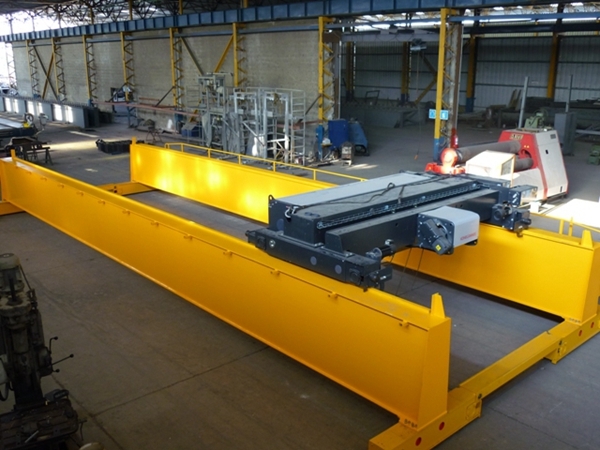 Single girder frame includes single main girder and two end girders. 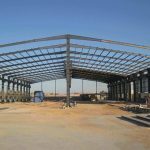 Double girder frame includes two main girders and two end girders. The main girder of single girder crane mainly adopts I beam steel or combination section of steel and steel plate. 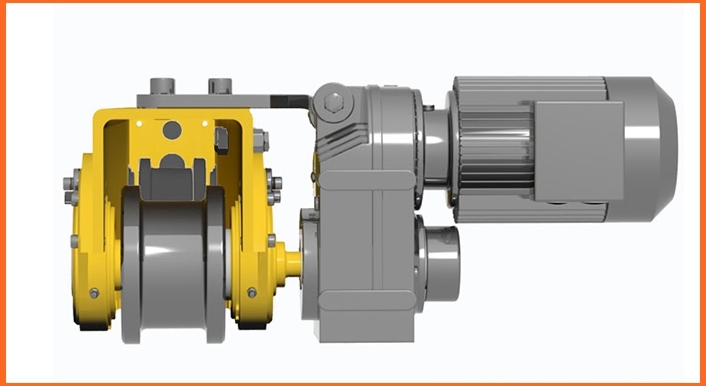 Lifting mechanism is electric hoist. According to girder supporting way, single girder crane includes top running crane and under-hung crane. The former crane refers to the crane that travels on the rail, the latter crane refers to the crane that hang under the frame. Single girder crane has light weight, simple operation and low cost. 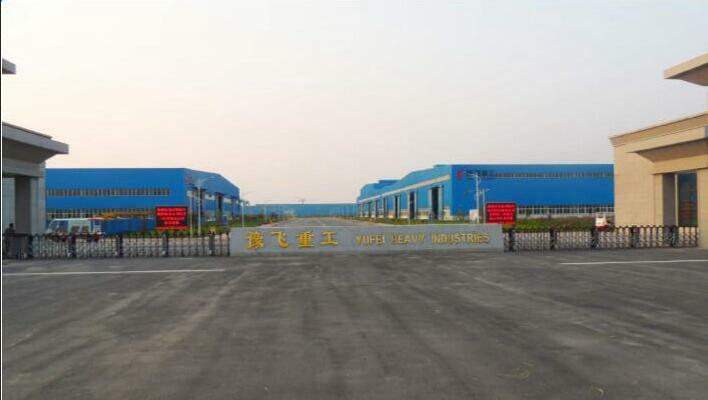 It is widely used in factory and warehouse. Gantry crane has similar shape with overhead crane. The main difference is that gantry crane has two supporting legs. Gantry crane travels on the ground rails. It is mainly applied for transporting,lifting and installing work in outdoor storage yard, port, power station and rail construction. Gantry crane and bridge crane has similar points as lifting mechanism, trolley traveling mechanism and bridge frame. Due to large span, gantry crane traveling mechanism adopts separate driving to avoid tilt traveling.